I will begin this review with a confession: I can’t say that every event I’ve ever reviewed was one in which I already had a deep interest. Generally, I leave festival events and end up adding yet more books to my never-ending ‘to read’ list. Susan Pinker’s event, however, was one I couldn’t wait to attend, and would have committed to attending even if I wasn’t volunteering as a reviewer. Besides the fact that I read The Sexual Paradox years ago and loved it—a somewhat isolated incident in a time when I didn’t enjoy reading non-fiction—and besides the fact that I am studying psychotherapy, and thus find anything about relationships really fascinating, Pinker’s most recent book is extremely valid to the technological age in which we live. 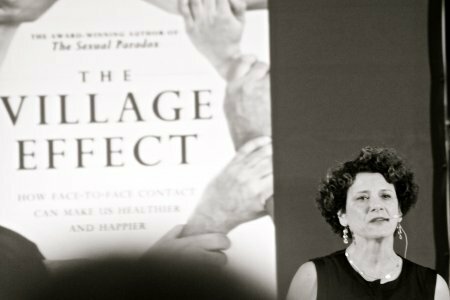 The Village Effect largely focuses on the importance of face-to-face contact, and I was delighted to experience that contact with Susan Pinker herself. If Pinker’s previous book is any indicator, I imagine that many will enjoy The Village Effect. Pinker opened her talk by pointing to social neuroscience, which is a relatively new field that I’m sure will only gain popularity as the general public realizes its relevance. And so, it is within the sphere of social neuroscience that Pinker writes her book and suggests that our relationships with other humans impact our thinking, and even our length of life. Pinker spoke in detail about her experience on the island of Sardinia in Italy, where she and her daughter interviewed elderly members of the community (you can listen to the resulting CBC Ideas program, The Longevity Puzzle, here). A meaningful experience in general, I’m sure, but what is particularly interesting is that on the island of Sardinia, there are an astounding number of centenarians—people over the age of 100. And although some would think that the physical island must possess magical qualities, Susan Pinker discovered that the biggest difference between Sardinians and people in North America is that no one in Sardinia is ever left alone. An initially annoying fact, to be sure, but it has great relevance for the often isolated or disconnected lives of North Americans. Pinker later referred a meta-analysis in which 309,000 participants were studied over more than seven years, and—as it turns out via this study—what reduces your chance of dying the most is strong relationships. Despite the value of being active or quitting smoking, how much you interact with other people ends up being a strong predictor of your mortality. And, interestingly, according to Pinker it doesn’t actually matter what you do, as long as you are spending time with other people. As my own experience can testify, there is deep value in seeing the same people in your community on a regular basis. There is nothing like the Bridgehead barista noticing when you’ve been away for a week, or getting back from lunch break late because you bumped into too many familiar faces. I have seen the village effect at work in my Ottawa life, and I am delighted to have a copy of Susan Pinker’s most recent book to root my experience in psychological research. Ultimately, Pinker pointed out that The Village Effect is a book about her own ‘village’, and about how each of us can connect with the principles of village living in order to live longer. Considering how many books I have on my reading list thanks to the Writers Festival, I will gladly take any longevity advice I can get! I always feel a touch worried when I go to a panel discussion. What if one author gets obviously more attention than the others? Has a more popular book? I don’t want to end up feeling bad for someone. I shouldn’t have worried. Not only were the authors of the Saturday night panel discussion at Knox Presbyterian, indeed, stronger than they may have seemed, they and their works were so completely different that direct comparison was gratifyingly a moot point. The fact that the authors are women, and that their protagonists are women “finding themselves in need of bravery, strength and smarts” to navigate their lives is a common thread. As became apparent, however, each woman has written a fascinating story equally about place as about person—and boy, are they different places! Each author spoke about the world they had created so absorbingly that the evening was a dizzying and delightful swinging back and forth from the 1950s in the northern community of Moose Factory to a gritty Montreal filled with near-feral cats, and to the prayer rugs and gossip klatchs of Muslim society in Ottawa. “Cowardice and courage,” in Sarah Waters’ own words, is what interested her when writing her latest novel, The Paying Guests. Set in 1920s London, England, the novel follows the fortunes of the widowed Mrs. Wray and her daughter Frances, whose comfortable lives have been shaken by the aftermath of the Great War. Their reduced circumstances oblige them to take in lodgers (the titular “paying guests,” a contradiction in terms which, as the author quipped, is an example of a great British euphemism) to maintain the home that is both Frances’ birthright and burden. Speaking to a sizable gathering at Knox Presbyterian Church on Sunday night, the award-winning author was reunited with CBC’s Sandra Abma who previously interviewed Waters five years ago after the release of the best-selling The Little Stranger. Clearly a fan of Waters’ back catalogue, Abma’s easy rapport with the author and audience made for a warm, welcoming atmosphere while her attempts to quash spoilers were met with rippling laughter from the crowd. This proved difficult at times for a book that Abma described as “maybe not a thriller, but thrilling” from an author known for “gripping tales, page turners” that are meticulously researched. Following this glowing introduction, Waters shared with the audience an early passage from her novel which not only provided a glimpse of Frances’ character but hinted at some of the broader themes of the text. A fluid, engaging reader, Waters brought to life the imagery present on the page, making listeners eager for the next chapter and the next. Afterward, in conversation with Abma, Waters discussed her interest in the 1920s, a time period of which she previously had had only superficial knowledge (that of flappers, jazz, and the like) and which was bookended by her understanding of the Victorian era and the 1940s, time periods visited in her earlier novels. She discovered a world very much in flux, one still reeling from the end of the First World War, visible in the former soldiers begging on the streets and a broader absence of men, killed at the Front. It was, as Waters described it, a “world newly unsafe” and drew parallels with the anxieties present in contemporary life. Yet, as “unhappy” or “tired” of a time it was, the 1920s also brought with it a new informality, evident foremost in clothing and changes to hemlines, as well as a new modernity, from the widespread electrification of households to the rapid adoption of the automobile. Against such a backdrop, too, was a renegotiation of gender roles as men and women adjusted to some of the freedoms gained by women during the war. All of this proved compelling for Waters. As Waters immersed herself in the research, it became evident that she had no wish to write about high society. Rather it was the suburbs that interested her, as well as issues of class, freedom, and people who on the surface seemed ordinary but would be “capable of great passion.” While drawing on newspapers, novels, maps, and material history still present on walks around London, Waters’ found her greatest inspiration in collections of British criminal trials, specifically the 1922 Edith Thompson murder trial, in which Mrs. Thompson conspired with her lover to murder her husband. The trial at the time attracted significant public interest, in large part, Waters theorized, because it highlighted anxieties around the shifting role of women at the time. Describing this and other trials as reading “like crime fiction,” Waters revealed that not only did such documents help shape her novel’s plot, they also proved an incredibly valuable resource for domestic details and the anecdote she shared about a pair of false teeth was met with resounding laughter from the crowd. Widely known for her historical fiction, much of the conversation during Q&A focused on Waters’ research and writing process. The Paying Guests, she shared, was a challenging book to write, especially compared to The Little Stranger which she found to be mostly straightforward once she had the ending clear in her mind. Her newest novel in comparison required endless rewriting, the results of which she actually stacked up and measured – an eye-watering 34 inches of discarded drafts. The difficulty, she revealed, was getting the tone just right. When asked if she might write a novel in the contemporary world, she said that as she evolves as a writer and becomes more interested in the craft of writing, she is becoming more open to the idea of setting a novel in the present and seeing what might emerge. Based on the audience reception, no doubt her next novel will also be snapped up, regardless of the time period in which it is set. It was an afternoon filled with literary enlightenment, as Joseph Kertes, Lee Henderson, and Eric McCormack took to centre stage at the writers’ festival. Host Neil Wilson, described the event as, “A master class on the novel,” and the audience sat in anxious anticipation of the literary adventures that were just ahead. “The authors will be happy to sign your books,” Wilson said to the eager crowded house at the beginning of the event at Knox Church. The audience erupts with boisterous laughter. Joseph Kertes, brings us into his novel, The Afterlife of Stars, by first sharing with us, memories of his personal family experiences of travelling from Hungary to Austria. On writing his novel, Kertes says, “I always start my writing in a real place, the characters take on their own trajectory. I planned out the chapters and the boys commandeered the plot away from me.” While his book could have been written as a memoir, Kertes says, “Sometimes the truth of the matter is not liberating. It doesn’t give you the whole picture.” In the excerpt he reads from his novel, we get a glimpse of what life was like for two young brothers. Kertes’s literature has well developed characters and the diction and syntax in his novel is engrossing. At this, his third presentation at the Festival, Lee Henderson, an award winning author and a teacher at the University of Victoria for Creative Writing, begins his presentation at the podium, by telling the audience that he wanted to take photos of them for his Instagram. In turn, they took pictures of him taking pictures. Henderson gives a detailed account of his novel. As he reads from his richly narrated book, The Road Narrows As You Go, you can hear the uniqueness of the characters’ voices. There is passion in his tone and he has the audience in stitches practically the whole way through reading his excerpt. Henderson, who took six years to write the book, insists the comedic portions of his novel just found their way in. “With prose, if the language started to go that way, I just let it,” he confesses. All three authors put on a stellar performance. The screen above the stage showed the audience a picture of a little eleven-year old boy dressed modestly, crying tears of exhaustion, hopelessness and fear. Sitting in a comfortable chair on the stage in a suit and tie was Tenzin, a student of translation and political studies at the University of Westminster in London, England remembering the moment depicted in the photograph when his and his older brother Pasang’s quest for freedom had run into a cruel impasse. “Look at Tenzin, [only] 11 on the screen and he is now [here with us]; he’s wonderful,” said Nick Gray, an award-winning documentary-maker and now first-time author of A True Story: Escape from Tibet, encouraging a warm round of applause echoing through Knox Presbyterian Church on a soggy Saturday afternoon. Prompted by the host, his sister Charlotte Gray , Nick read a short passage from the book which he wrote several years after the documentary had been made as it is “the only book of its kind,” taking the reader on a long tiring journey through the most daunting escape route in the world, the Himalayas. The passage Nick shared described an encounter of Tenzin and Pasang with the Chinese guards. Soaked, beaten, distressed, hungry and frightened, Tenzin was losing every hope of ever achieving freedom. At that moment he wished to go back to their village to live with their mother and work in the fields but Pasang offered an alternative: they were going to persist and pursue studies in a monastery in Lhasa. Thus, the treacherous journey continued. The production of this documentary was unlike any other. In order to be able to show people’s faces without shading them and exposing them to the possibility and danger of execution, abuse or exile, the filming took place outside of Tibet. Tenzin and Pasang, while sensing the involvement of some Westerners in their journey, were not aware of being showcased in a documentary. As a matter of fact, when they first came across Nick, they didn’t recognize the video camera; they did, however, notice a ‘weapon’ on a tripod. It wasn’t until a copy of the video was sent to the monastery through Pasang’s friend in 1996 that Tenzin watched himself on TV for the very first time. The powerful message of the film was spreading through the UK as well as the United States; the documentary was shown repeatedly, including at the State Department and the White House where Hillary Clinton had watched it before her visit to Nepal. Suddenly, the boys began receiving letters, money and even chocolates. Eventually, they were sponsored to come live in England and arrived to London on one cold November afternoon. What impressed me the most about Tenzin is how sincere, humble and grateful he is – for the crowded subway he has to take to school every day, for the enriching experience the University of Westminster has provided him with, for the opportunities that have been presented to him. While it is important his communication with Tibetan support groups remains limited, I am so glad that he and Nick came to speak to us openly about the difficult destiny of the Tibetan refugees and let us be part of this incredibly touching story of courage, resilience, hope, and friendship. According to Lynn Coady, writers have two choices when it comes to storytelling: they can gloss over the real, unvarnished ugliness of reality, or they can write honest, uncomfortable stories about real people. Though it hasn’t always won her universal acclaim, Coady is dedicated to the truth. The crowd in the Kailish Mital Theatre ranges from young to old, but there is an undeniable youthful energy in the air. Carleton’s creative writing undergrads have come out in droves to hear the 2013 Giller prizewinner deliver the annual Munro Beattie Lecture. In doing so, Coady joins a prestigious list of Canadian creative writers and literary critics who have graced the stage since the creation of the lecture in 1985, including Northrop Frye, Jeanette Armstrong, Carol Shields, Mark Kingwell, and Adam Gopnik. Lynn Coady is an accomplished novelist and short story writer who grew up in Port Hawkesbury, Nova Scotia, and now calls Edmonton home. Hellgoing, her latest short story collection, won the 2013 Scotiabank Giller Prize . It was only the fourth time in the award’s history that a short story collection took home the award. Her lecture begins with a moment of silence to honour Cpl. Nathan Cirillo and Warrant Officer Patrice Vincent. The crowd falls into a stark and respectful silence for a moment, broken only when Coady remarks that violence in Ottawa (and Canada) is so rare that in some ways she is grateful to not be numb or desensitized to it. It is fitting for an author praised for her unflinching delivery of the honest truth to acknowledge the horrific events that shook Canada this past week. Even in the warm comfort of the theatre, we readers and listeners are reminded of the realities of the world. This talent has sometimes been to her detriment. Her 2006 novel Mean Boy, a story about a small town Atlantic Canadian boy obsessed with his poetry professor, was inspired partly by her own interest in deceased Canadian poet John Thompson. The events in her book are fictional; the ties to the real-life Thompson are tenuous at best. During her promotion of Mean Boy, an incident occurred in Sackville, New Brunswick, home of Mount Allison University, where John Thompson had taught. People who had known Thompson had connected the dots in Mean Boy and accused Coady of rifling through the poet’s life and stealing from it. They accused her of behaving immorally. Their complaints were twofold: Jim Arsenault (her main character based loosely on Thompson) was too much like Thompson and also so much unlike the Thompson they knew. Coady explains that there wasn’t much she could do to convince her critics that she had never intended for ties to John Thompson to be made. In their eyes, she was a thief and a liar. But her painful experience in Sackville led to the creation of her 2011 novel, The Antagonist, in which her main character Rank recognizes himself in the writings of an old friend and sets out to correct his false depiction. In some ways, this novel was Coady’s response to a specific critic in Sackville, and Rank’s journey of discovery is one she hoped said critic would embark on. Rank comes to realize that everyone recalls his or her own version of events and that storytelling, by its nature, is difficult. Coady believes that our hunger for stories has nothing to do with comfort, though it may feel that way. What we are searching for is the truth. As a reader, she tells us, she responds best to troubling novels. In her question and answer period someone asks her to expand on the idea that she wanted her Sackville critic to understand the challenges of writing. Coady explains that writing a novel is a psychological ordeal. Writers, more than anyone else, need to discover sympathy for unsympathetic characters. They need to spend exorbitant amounts of time on people most of us wouldn’t want to spend any time on. Morality, she says, lies in how an author wields their power. To tell a story is to entertain, but fiction is the one place where we can be honest, whether that honesty is well received is up to the reader. In Coady’s eyes, by being honest, the writer’s job is done. C’est devant un maigre public de francophones et francophiles, rassemblés au sommet de la tour Desmarais de l’université d’Ottawa, que s’est tenu l’un des premiers événements de langue française de l’histoire du festival. Invitée avec le soutien de l’Alliance française et de l’Ambassade de France, l’auteure et universitaire française Joëlle Pagès-Pindon a habilement réussi à transmettre sa passion—fort bien documentée—pour les nuances de l’œuvre monumentale de Marguerite Duras, figure emblématique de la littérature française du XXe siècle. S’appuyant sur l’ouvrage posthume Le Livre dit , qu’elle a elle-même recherché, annoté et publié chez Gallimard, Pagès-Pindon a brossé un portrait intime de Duras ainsi que des électrons plus ou moins libres qui gravitaient dans son univers personnel. C’est ainsi que le public, conquis d’avance, a pu savourer anecdotes et révélations sur Yann Andréa, à la fois muse et compagnon improbable de Duras; sur le penchant quasi obsessif (mais si romanesque) de cette dernière pour les amours interdites; et sur les nombreux paradoxes qui animaient Duras dans son art et ses prises de position. En écoutant Pagès-Pindon, on en venait presque à voir Duras au travail, à l’imaginer attablée à son bureau, cherchant à tout exprimer par son écriture et son art, parfois avec la maladresse qu’on lui connaît, mais toujours avec sincérité et précision. Ne mordant pas à l’hameçon tendu par le public et l’excellente animatrice Catherine Voyer-Léger, l’auteure est demeurée prudente au sujet de l’impact politique des écrits de Duras. Aujourd’hui encore, la seule mention du nom de la célèbre écrivaine suscite souvent une vive controverse en France, en souvenir des polémiques qu’avaient jadis soulevées ses propos tranchés. Pagès-Pindon n’a toutefois pas hésité à reconnaître la contribution de certaines œuvres—pensons notamment à Hiroshima mon amour , ou bien au célèbre L’Amant , qui lui a valu le Goncourt en 1984—à la psyché française de l’après-guerre. Il n’en demeure pas moins probant que l’Asie, qui a tant marqué Duras, s’arrache toujours les dernières traductions de ses œuvres, et sollicite, encore cette année, les lumières de Pagès-Pindon lors de ses grandes tables rondes. Il était difficile de ne pas voir, en cette soirée, l’incarnation même de l’esprit du festival : un entretien courtois et enjoué avec une auteure accomplie, qui ose consacrer ses talents à l’analyse d’une autre auteure encore d’actualité. Notons par ailleurs la qualité du public qui, bien que clairsemé, a su alimenter la discussion de façon informée et articulée. Il est à espérer que le festival, ainsi que ses partenaires, poursuivra cette programmation de langue française, et que le public s’y rendra en plus grand nombre. J’y serai certainement. As a special prelude to Ottawa International Writers Festival the Southminster United Church filled to the brim and became the site of a humour-filled conversation between the host Seamus O’Regan and the man applying for the job of Canada’s next Canadian Prime Minister, Leader of the Liberal Party of Canada, Justin Trudeau whose autobiography had appeared on the shelves of bookstores across the country on October 20th. Not hiding his curiosity of a memoir published at the tender age of 42, Seamus prompted the first-time writer to justify the timing of its release given the approaching federal election of 2015. Choosing laughter to establish rapport with the audience, Trudeau responded by addressing the audience with a series of trivia-like questions about the evening’s host. “Even people well-known to Canadians have stories [we are not familiar with] which allow [us] to trust the judgment of those in the highest representative roles,” said Trudeau. His motivation for filling the blank pages were a few: To share experiences shaping his life, to explain his vision of our country as shaped by meeting Canadians all throughout his life, and to show them that as their representative he understands their issues and concerns. Trudeau admitted to diligently writing and rewriting each section of the book until a common thread became apparent and the initial choppiness eliminated. Most of the writing took place in the evenings and vacations on his iPad using an external keyboard. It was a “huge endeavour” but the realization that every single word in the publication is his own has been tremendously rewarding. The end goal was not to tell the reader about himself but to find—through careful reflection on the events and people that have affected his life—the ‘common ground’ between Canadians as individuals and citizens bound by a unique set of values directing their approach to the world that defines them. While criticized for being a campaign document and a mere attempt to brand the politician, Common Ground does not center on policy. Instead, it is meant to express Trudeau’s gratitude to the people of Canada for giving him 35 million shoulders to lean on in a time of family tragedy and to tell Canadians about what experiences and encounters have shaped his current approach to policy. The interview served up amusing previews of some of the anecdotes Trudeau shares in his book, including the memory of Ronald Reagan reading him poems, or Princess Diana visiting 24 Sussex. Justin Trudeau’s charisma and willingness to open up enabled easy bonding with the crowd; it is indeed very difficult not to feel affection for someone who admits to having run into a lamppost on the first date with his now wife. Not surprisingly, the brief question-answer period that had taken place before over 100 attendees lined up to shake hands with the interviewee and to get their books signed reflected an effort by future voters to address the one pressing issue the book does not address: policy. From surveillance and security through unemployment to the economy in general, Justin Trudeau gained a good sense of what people’s concerns and interests are through encounters such as this one.